Updating 5/2017 for my neighbors daughter’s First Holy Communion. First and foremost, times flies. It is hard to believe that my daughter had her First Communion Party seven years ago. I have had two other ones since, but I feel the first one is always when all the family flies in. 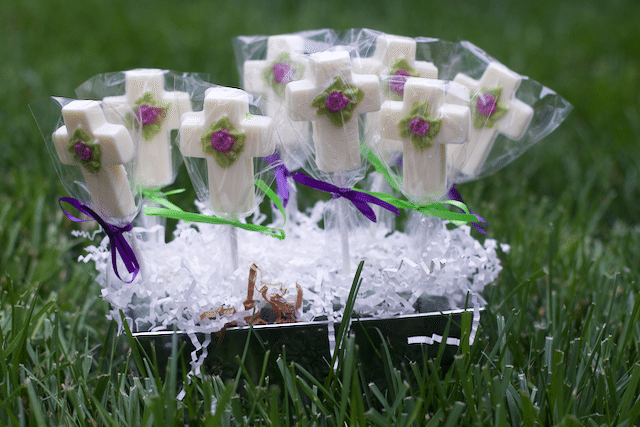 I wanted to share some easy and last minute first communion party ideas that will make that day a little more special. This weekend was my daughters First Holy Communion and I had 10 to 15 guests in the house for any given meal. So any efforts to throw a First Communion Party were easy and many can be done last minute. Since mass is typically in the morning, I prefer throwing a brunch right after church. Brunch is an easy meal to prepare and most people like to get on with their day so they don’t hang around for hours after! Of course I could not resist making these chocolate party favors that also served as the centerpiece. 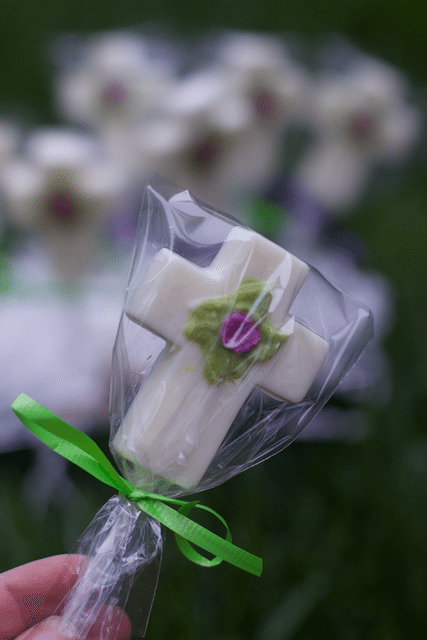 You can find Cross molds in the candy making aisle of your craft store or Amazon. Make these cross chocolate pops over a week in advance, just keep in a cool place. Chocolate pos are not that hard to make you just need a few supplies to get the three color chocolate to look nice. 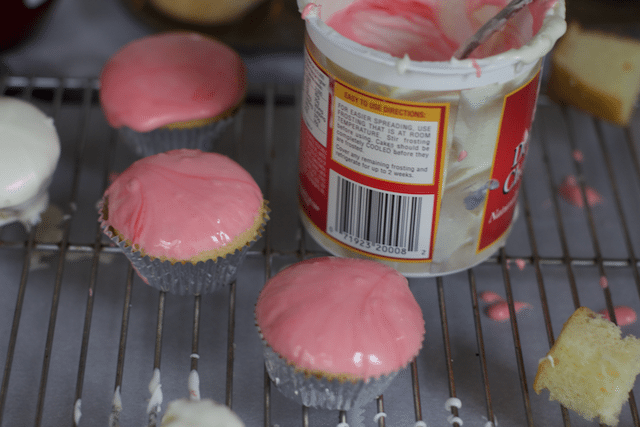 These cupcakes are super simple and the cupcakes can be made and frozen a few weeks ahead and then defrost and dip them in the frosting the day before the party. 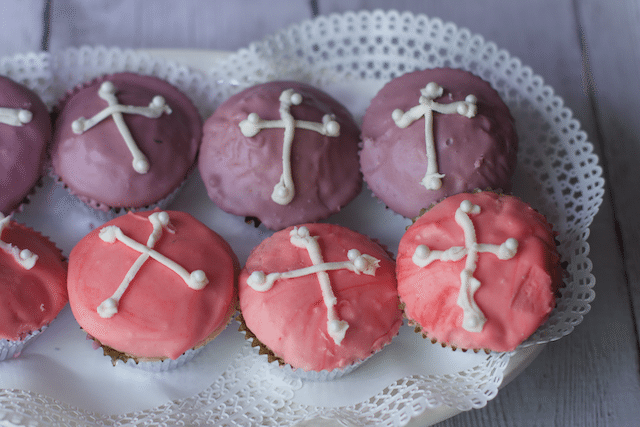 If you don’t want to make a first communion cake then these cupcakes are a great substitute. 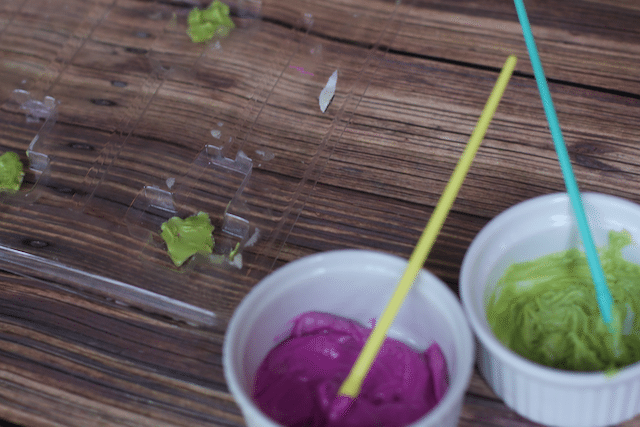 Melt store bought frosting in the microwave for 15 to 30 seconds, add coloring and dip cupcake. 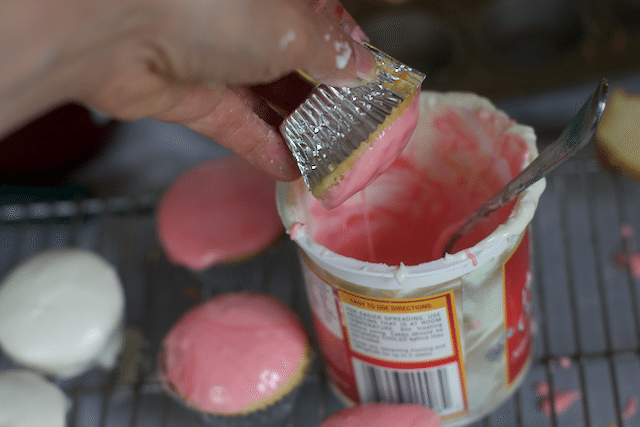 Allow the frosting to harden, it will still be a little soft but shiny and solid. When dried add adornments with extra white frosting placed in a ziplock baggy. I decided to add little pearls too. 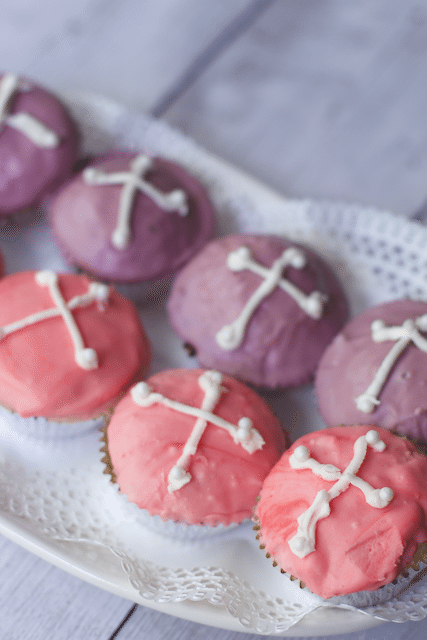 These easy cupcakes make an adorable addition to a First Communion Dessert Table. Do you have any First Holy Communion Traditions? 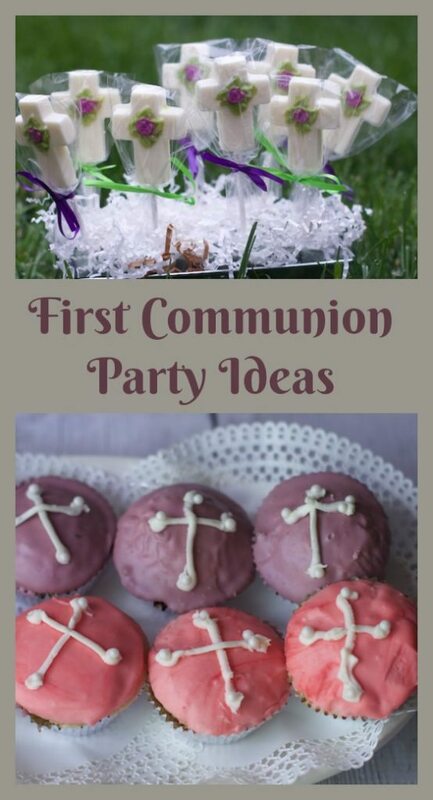 You can use any of these Last Minute First Communion Party Ideas for any occasion. Pin this for your next party! 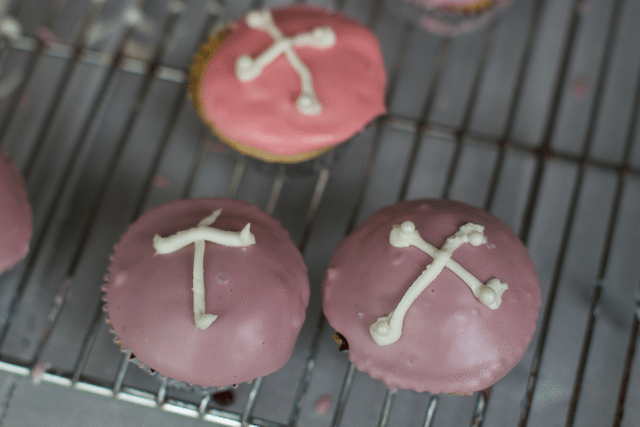 thank you so ,much, I just dip them in the frosting no piping except the little cross. These are so gorgeous! You did such a great job with the frosting too. I am so horrible at piping frosting. Love these!